Half-way around the world, at the tip of Java, just south of the equator, lies the little island of Bali. Green and undulating in its mountainous areas, yet flat and moody along its coasts, Bali is hauntingly beautiful. Its atmosphere is primeval and permeated with magic. The volcano, Gunung Agung, veiled in clouds, dominates the island. According to legend, the gods live on the exalted peak of Agung; there they watch over he pageant of Balinese life. The foundation of this ordered society is the Bali-Hindu religion, which pervades every aspect of life. With its roots in Indian Hinduism, the Balinese religion envelopes the animistic tradition of the Indo-Chinese who first inhabited the island, strengthening the belief that the gods and goddesses were present in all things. Anything in nature therefore, can possess a power of its own, which is a reflection of the power of the gods. Tapel means mask in Balinese, and tapel creates more than character. 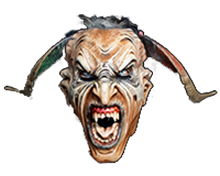 The mask’s powerful lines catch the light better than the human face, the stability of the features hold a piercing potency stronger than a human grimace. In performance with Balinese Gamelan music, it is the machinery of motion, the catalyst of instinct, creator of rhythms. The dark holes of the eyes deliver inward glances. We find the archetypes of society through the study of the mask. The principle characters and their allies are defined on a moral basis and illuminate the ethics of human relationships. Balinese masks contain a large range of visual form and philosophical nuances. As sculptural pieces, both the historic and contemporary forms have significant beauty. But masks are also considered to be living presences. Stories circulate in Bali of masks that, without human intervention, scream, breathe fire, kill people, fight each other, and even save a masquerader’s life. 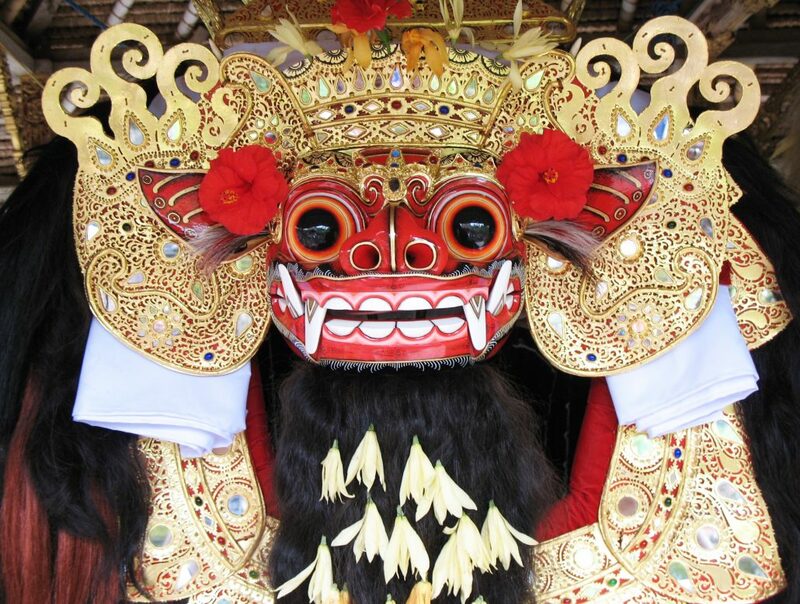 The Barong Landing: two or more giant puppets who serve as protective spirits for the villages who host them, and representing the ancestors of the Balinese, protecting them from malignant spirits. The Topeng dance which enacted stories from the old Balinese kingdoms, and establishes a link with the ancestors. The Wayang Wong, an enactment of the Ramayana epic, which teaches morality to Balinese, dramatizing the triumph of virtue over vice. The Calon Arang Drama, an exorcism of low spirits and black magic, by calling for the support and protection of Durga, the goddess of death. The Barong, a drama derived from the Mahabharata and an illustration of the ongoing battle between the force of good and evil. Some of these dances are regularly performed for visitors in high-quality tourist performances, sponsored by local community groups in the village of Ubud. For those who want the more authentic experience, it is necessary to attend one of Bali’s many temple festivals, for, with the exception of Barong Landing which is performed in procession on the road, that is what they are designed for. It has been said that there is a temple festival somewhere in Bali, almost every night of the year. If you are lucky, it might be the village in which you stay. If not, you will need to hear about it through the grapevine or with some research and perseverance. About the guest blogger: Judy Slattum is the author of the foremost book on Balinese masking traditions: Balinese Masks, Spirits of an Ancient Drama published by Periplus Editions, Singapore, and distributed in the U.S. by Tuttle Books. Judy, along with her husband Made Surya, a mask carver and dancer, are co-directors of Danu Enterprises, specializing in educational travel to Bali. In July 2018 they are offering a two-week trip Bali Arts Immersion, including classes in mask carving and mask dance with working artists. For further information go to www.danutours.com. 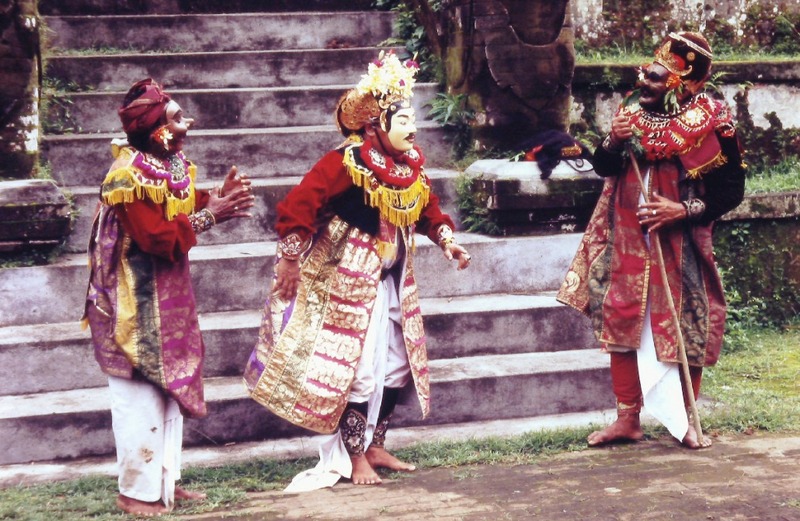 A Topeng drama, with the Dalem (King) consulting with the clown servant Merdah and a priest. 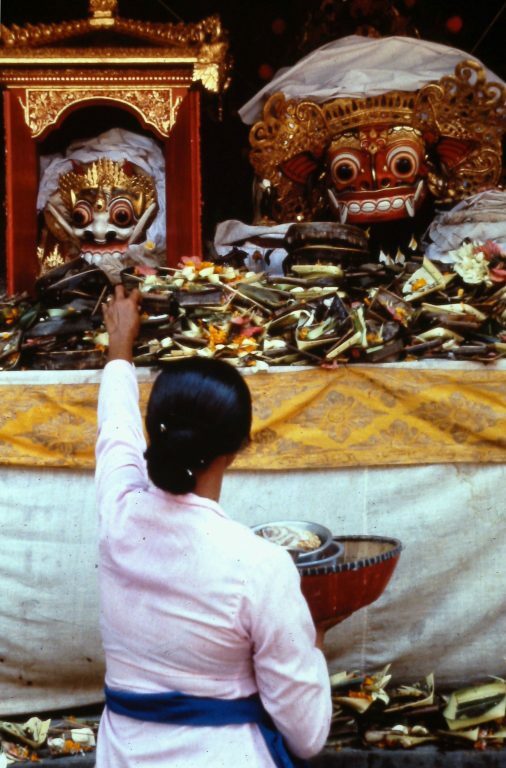 Worship of Barong and Rangda masks at a Balinese temple. Closeup of a Barong Ket, festooned with flowers on a temple altar.